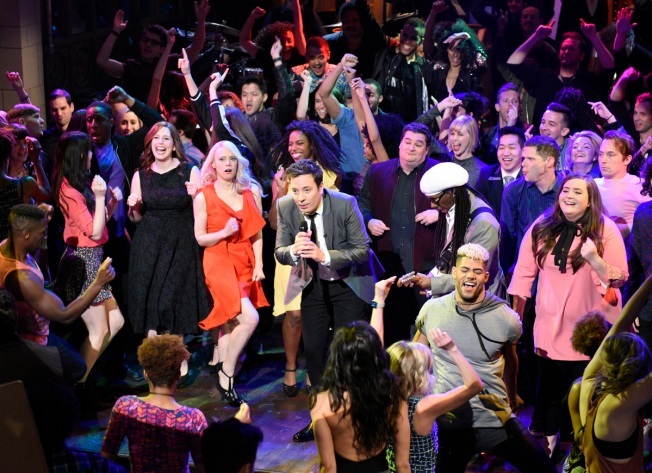 In this April 15, 2017 photo released by NBC, host Jimmy Fallon, center, performs during the live opening number on "Saturday Night Live," in New York. The network's telecast last weekend, with musician Harry Styles and Alec Baldwin and Melissa McCarthy delivering their hit impersonations of Donald Trump and Sean Spicer, was seen by 7.87 million people this weekend, or 21 percent more than the previous week's telecast, the Nielsen company said. NBC's decision to air a live version of "Saturday Night Live" in every time zone has paid immediate dividends. The network's telecast last weekend, with host Jimmy Fallon, musician Harry Styles and with Alec Baldwin and Melissa McCarthy delivering their hit impersonations of Donald Trump and Sean Spicer, was seen by 7.87 million people, or 21 percent more than the previous week's telecast, the Nielsen company said. For the first time, NBC decided to air the show live from New York in the Mountain and Pacific time zones — then repeat it in the show's customary 11:30 p.m. time slot. Nielsen did not immediately have exact numbers on how much this decision boosted viewership. But counting both airings, overnight ratings among young viewers in the two Western time zones more than doubled over the previous week's telecast. Among the 18-to-49-year-old demographic last week, "Saturday Night Live" had more viewers than all prime-time shows except "The Big Bang Theory" and "Empire." It has been a banner year for NBC's comedy institution. When people who record the show and watch within a week are counted in, the typical "Saturday Night Live" edition is seen by 10.9 million people each week, Nielsen said. That doesn't even count the way many people view late-night comedy these days, through clips spotted online. The television viewership is up 29 percent over last year and, NBC said, is the show's best season since 1993-94. The show typically does well in election years. What makes this season different is the audience has remained strong after the election, fueled by Baldwin's indelible Trump impersonation and McCarthy's instant-classic take on the president's press secretary. CBS won the week in prime-time, averaging 6.6 million viewers. ABC had 4.5 million, NBC had 4.4 million, Fox had 2.5 million, Univision had 1.5 million, Telemundo had 1.2 million, ION Television had 1.1 million and the CW had 900,000. Fox News Channel was the week's most popular cable network, averaging 2.33 million in prime-time. Boosted by the NBC playoffs, TNT had 1.66 million viewers, HGTV had 1.47 million, MSNBC had 1.466 million and ESPN had 1.31 million. ABC's "World News Tonight" topped the evening newscasts with an average of 7.61 million viewers. NBC's "Nightly News" had 7.56 million and the "CBS Evening News" had 6.2 million. For the week of April 10-16, the top 10 shows, their networks and viewerships: "The Big Bang Theory," CBS, 11.89 million; "Dancing With the Stars," ABC, 10.31 million; "Stayin' Alive: Grammy Salue to the Bee Gees," CBS, 10.31 million; "The Voice" (Monday, 8 p.m.), NBC, 9.88 million; "Blue Bloods," CBS, 9.43 million; "NCIS," CBS, 9.06 million; "Hawaii Five-0," CBS, 8.49 million; "Survivor," CBS, 8.32 million; "60 Minutes," CBS, 8.16 million; "The Voice" (Tuesday), NBC, 7.76 million.